Lesson 9: In this lesson, you will learn how to conjugate 이다 which is conjugated differently than other verbs and adjectives. You will learn about how to conjugate 이다 in the four honorific formalities that you already know. In addition, you will learn how to use 이다 to conjugate verbs/adjectives to the future by creating endings like: 먹을 것이다. Lesson 10: In this lesson, you will be introduced to two different sets of Korean numbers and how to use them in situations. After learning the numbers, you will learn how to count things in Korean by using numbers and a counter. With these numbers, you will also learn how to tell the time in Korean. Finally, two words related to time (처음 and 마지막) will be introduced to you before you move on to learn more about ‘time’ in Lesson 11. 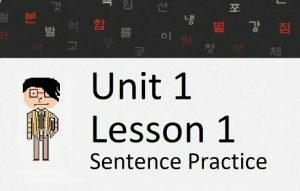 Lesson 11: In this lesson, you will build on what you learned in Lesson 10 by learning how to use a variety of different words of time in Korean. Using these words, you will be able to say “I did ____ for 2 months” or “I didn’t ____ last week.” You will also learn whether you should use the pure Korean or Sino-Korean numbers when talking about these different words of time. 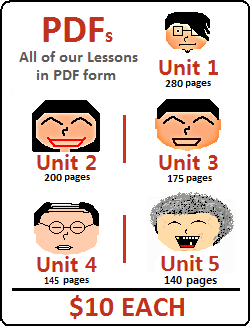 Lesson 12: In this lesson, you will learn more of the most commonly used Korean Particles. Using particles like 들, 만, 에서, 부터, 까지 and 로, you will be able to create more complex sentences. Additionally, you will learn tips on how to use these particles correctly in conversation! Lesson 13: In this lesson, you will continue to learn some of the most commonly used Korean Particles. Here, you will learn how to say “and” (와/과, 랑/이랑, 하고), “with” (와/과 함께, 랑/이랑, 하고), “to” (에게, 께, 한테), “from” (으로부터, 어게서), “for” (를/을 위해) and “about” (에 대해) in sentences. Lesson 14: In this lesson, you will learn something that will almost certainly make your head spin. You will learn about passive verbs in Korean – and one of the main reasons this concept is so difficult is that most people are not aware of passive verbs in their own language. 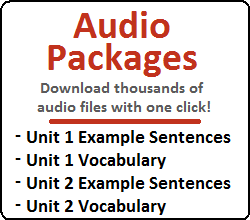 Passive verbs aren’t used that much, but they are used sometimes and it is a very important concept that you must know before going any further. I am sure you will be confused after this lesson… if so, ask us a question! 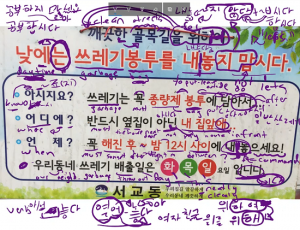 Lesson 15: In this lesson, you will learn a bunch of different miscellaneous Korean Grammar points that I couldn’t put into any other specific lesson. In this lesson, you will learn about adding 아/어 하다 to words like 좋다 and 싫다, and how sometimes adjectives in Korean can act on objects (which usually can never be done). You will learn about Korean Homonyms like 들다 and 걸리다. You will also learn about compound verbs in Korean, and how to express yourself when you are sick. Lesson 16: In this lesson, you will learn about ~적 and ~스럽다, which can be added to some words in Korean to give them slightly different meaning. Use this lesson to learn about how to properly use these two in Korean sentences! Lessons 9 – 16 Mini-Test: Test yourself on what you learned from Lessons 9 – 16! A Mini-Test like this will be uploaded after every eight lessons. Don’t worry if the test doesn’t go so well – this website is here to help you!